Presently, over 70 million Americans suffer from some type of sleep disorder. A majority of them are not even aware of the dire condition that ails them. The modern day lifestyle is a stressful one. In fact, most people will decide to sacrifice their good night’s sleep in order to finish more tasks in the evening hours. A prolonged negligence of a healthy sleep routine can result in various sleeping disorders. They include Sleep Apnea, Leg Cramps, Insomnia, Restless Legs Syndrome, and Narcolepsy. Therefore, the number of people suffering from sleep deprivation continues to grow. As a result, sleep aiding drugs such as Provigil and Nuvigil are being prescribed as a last resort to provide the much needed sleep. Provigil and Nuvigil—What’s the Difference? 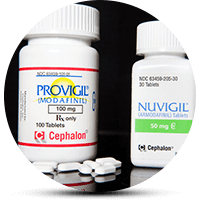 The biggest difference between Provigil and Nuvigil are their side effects. Furthermore, even though Provigil comes with more side effects, statistics show that it is more frequently purchased by patients due to its lower cost. As for the difference between the efficacy of Provigil and Nuvigil, research shows that there is none. How to Take Provigil and Nuvigil? You are not allowed to share the drug with anyone. If you are a person younger than the age of 19, you should not be taking the drug. You should store the drug at room temperature and away from heat and moisture. Which Activities Should I Avoid While on Provigil and Nuvigil? Avoid operating heavy machinery, driving and/or other activities as these analeptics may negatively influence certain senses. They include your perception, thinking, and reaction. Avoid drinking alcoholic beverages while on these medicines. The users should put all dangerous activities on pause while on these analeptics.